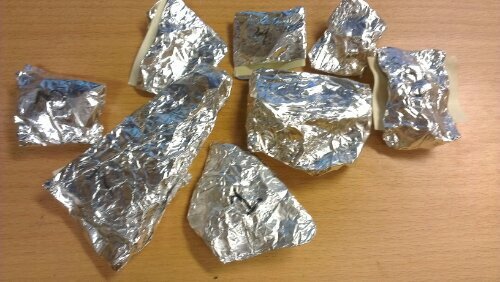 Eight small aluminium foil packets, each with a small piece of speleothem or erosion surface samples, ready to be sent to the granite speleothem expert Juan Ramón in Coruña, Spain. Our (or rather Juan Ramón’s) working hypothesis is that the speleothems are not calcite (as usually in caves), but the more exotic minerals pigotite and perhaps also opal-A. Pigotite is a pseudo-mineral, an aluminium-rich organic compound and is fairly common (relatively speaking) in granitic caves. Some of the samples we have show a layered structure, like the growth rings in trees, that may correspond to different growth periods. Can these speleothems be used for palaeoclimatological reconstructions??? One thing that would be very interesting is to have a C14-dating of some of the speleothems (anyone who knows a cheap and reliable lab?). Opal-A, or amorphous opal, is a non-crystalline pseudomineral of silica that might be formed after biogenic dissolution of quartz in the granite and then precipitation of the opal-A; also this process might be linked to biologic activity. Interesting stuff, this! So let’s do a science! Juan Ramón has written an easily accessible paper on speleothems in granitic caves: Speleothems of granite caves in Communicacões Geológicas 2010.